In a leadership session this morning with Leadership Academy GLOW (girls leading our world), I learned that a good leader is one who inspires others to accomplish a goal. I guess I’m a good leader! In June, 2013, the Peace Corps will leave Bulgaria and no longer participate in the GLOW program, which they founded in 2000 to teach adolescent girls about good communication, leadership, and health. Last summer, after learning about their departure, I had the idea to bring American volunteers from WCSU to replace the Peace Corps volunteers. Along with Dr. Darla Shaw and two students from WCSU, Thea Tragni and Rafael Bastos, and three current Peace Corps volunteers, I am outside of Veliko Tarnovo at Leadership Academy GLOW with 80 girls from across Bulgaria. The campers range in age from 14 to 18 years-old. This year was particularly competitive, as 120 girls completed applications for just 50 positions. Along with approximately 20 counselors and assistant counselors and project leaders, we began our stay with three days of training before the campers arrived. We are now halfway through the first day of our first week of camp. The days are long, but fun is emphasized along with learning. The day begins with a 15 minute ‘energizer’ (outdoor games that help the girls bond) and there are lots of hands-on activities and role playing opportunities (anyone for building s straw tower with a blind-folded 'construction engineer?). There is also fun stuff that encourages the girls to get to know each other. For example, today we ate lunch with our wrists tied to the person on either side of us. Each day too and evening there is a theme. Today, we all wore something red and tonight there is a Hawaian Night and Beach Party (without the beach!). Actually, only the first part of my goal was accomplished! When we return to the US, our group has plans to write grants, fund raise and recruit volunteers for next year. Well, I already have a list of volunteers for next year, so that part is under way. I will continue to write updates about our GLOWing adventures. You can follow the GLOW girls on Facebook and visit their web site at Leadership Academy GLOW. In other words, do children give us clues about whether they're going to ultimately be sexually attracted to males, females, or both? To a certain extent, yes. That's why plenty of gay and lesbian adults can point to childhood clues that they were "born this way." Most straight people could do the same, although typically no one asks straights when they knew they were straight. Behavioral patterns in childhood do show some correlation with adult sexual orientation. Vilain points, for example, to the evidence from girls born with a disorder called congenital adrenal hyperplasia (CAH), including that gathered by the University of Cambridge psychologist Melissa Hines. CAH results in naturally increased levels of androgens (a "masculinizing" type of hormone), and females with CAH show relatively high early interest in male-typical childhood activities as well as relatively high rates of bisexuality and lesbianism as adults. Many of the points articulated in the Atlantic piece have been addressed here in earlier posts. 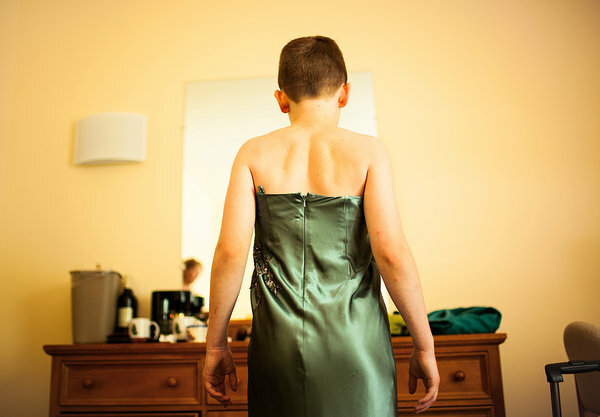 Regardless, the argument of nature vs. nurture in terms of gender expression appears to more a continuum of male to female, and vice versa, than a hard line dividing the two.